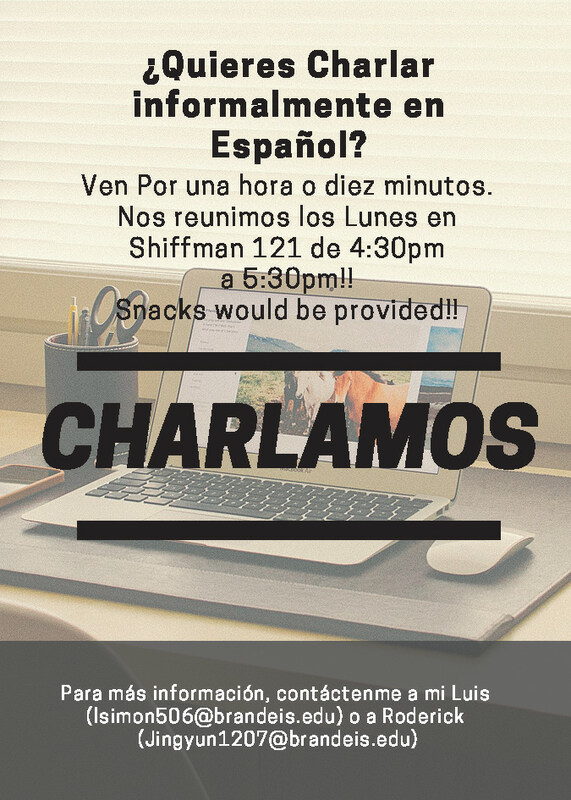 Anyone interested in informally practicing their Spanish are welcome to attend CHARLAMOS. Students attend weekly meetings to meet socially, speak Spanish, and to share ideas, music, and photos. If you have any questions, please contact Luis Flores. ¿Quieres charlar informalmente en español? Puedes venir y salir en cualquier momento-- pasa 10 minutos, o una hora, como prefieras. Si quieres agregar tu email al listserve de Charlamos, contactar con Luis Flores. Brandeis Latinx Student Organization (BLSO) provides social, academic, and emotional support for the Latinx community. With various educational events throughout the year, BLSO aims to enlighten all who are interested in Latinx culture, history, and current events, to provide and maintain a safe space for all Latinx students, and to promote all aspects of the Latinx culture to unite the Brandeis community. Building upon Brandeis’ legacy of social justice we seek to hold the university accountable and address the concerns and demands of our community. If you have any questions, please contact BLSO President, Carmen Lopez-Landaverde. If you want to be more involved in the latinx community, please helps the BLSO eboard by filling out this survey form.